Miss Feet Down First pictured winning the 2015 Grade 1 Southwest Juvenile Championship at Zia Park. WAYNE, OK�APRIL 3, 2017�Royal Vista Ranches stallions were well represented in two stakes races over this past weekend. Grade 1 winner Miss Feet Down First gained late under jockey Francisco Calderon to finish a close third in the Grade 3 $51,602 Decketta Stakes for fillies and mares at Remington Park. Trainer Victory Gonzalez saddled the DOMINYUN 4-year-old filly for owner Esequiel Porras. Isbell Charoais bred the filly in Texas from the First Down Dash mare Feet Down First. The $5,451 third-place Decketta check brings Miss Feet Down First's earnings total to over $302,000. In 2015 Miss Feet Down First won the Grade 1 Southwest Juvenile Championship at Zia Park. On Friday night, the IVORY JAMES filly Barefoot Beach finished second in the $20,000 Miss Houston Stakes at Sam Houston Race Park. AQHA Racing Champion trainer Judd Kearl saddled Barefoot Beach for owner Samuel Martinez. Bobby Cox bred the multiple stakes winning daughter of IVORY JAMES in Texas from the Invisible Injun mare Babe On The Beach. 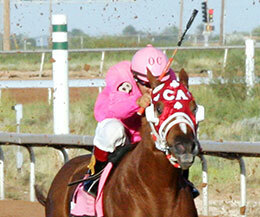 Ridden by Noe Villatoro, Barefoot Beach earned $4,000 to booster her earnings total to $83,787. Barefoot Beach won the French Quarter Stakes at Fair Grounds Race Course and the Evangeline Downs Dash Stakes last season.